It would be hard to find a worse example of urban blight than the area round Heathrow airport. The country there, twenty miles south of Watford, where the Colne meets the broad valley of the Thames, was once, long ago, a place of rushes and placid water, of willows and marsh. But the Thames gave birth to London, and London grew. The river plain makes an ideal site for one of the world’s busiest airports. An airport of course brings development of the road system, which in turn brings factories. Besides this, the valley floor is replete with gravel for the construction industry. We see today the result of all this. The area has been devastated. Everywhere the eye falls there is ugliness: pylons, motorways, industrial estates, concrete hotels, scrap yards. The very landscape seems to be in continual turmoil, ceaslessly being bulldozed and reshaped. Once every two or three minutes an airliner leaves and another one arrives, and even with today’s quieter jets the noise is inhuman, intolerable. The people who live there must shelter behind double or triple glazing, and some shelter behind tranquillizers. What is very surprising to learn is that this district is one of the best in England to see birds. The birds care nothing about aesthetics. Their main concern is food. Once, at the Perry Oaks sewage farm beside the airport, I saw a party of waders happily feeding while a Boeing 707 tested its jets on an adjacent runway. The noise was so horrendous that I had the alarming experience of feeling my whole diaphragm, my ribs and chest, beginning to vibrate. The sewage farm is destined to be buried under a new terminal*, and, ever since terrorists threatened to shoot down an airliner at Heathrow with a surface-to-air missile, members of the public are no longer allowed there. But, if the sewage farm is no longer accessible, there are other places that are. 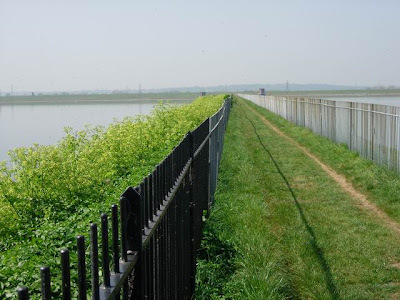 A little way to the south, just by Stanwell Village, lies one of the most famous birding sites in the country, Staines Reservoir. When it was completed in 1902, Staines must have been seen as a wonder of modern engineering. Its surface area of 424 acres is divided in two by a ruler-straight causeway, 1100 yards long, aligned from east to west. The reservoir is so large that it has its own miniature tides; the water is hardly ever still, and even a light breeze drives it into waves which break against the concrete slabs of the leeward side. The fame of Staines Reservoir began with a series of papers in The Zoologist for 1906 and 1908, written by G. W. Kerr, who reported seeing as many as 80 great crested grebes there – quite an event at that period. In Edwardian times bird-watchers were few and far between: regular observations at Staines were resumed only in the early 1920s, by such stalwarts as W. E. Glegg and A. Holte Macpherson, who established Staines’s reputation as a major site for wintering waterfowl. The recognition of reservoirs as unofficial bird sanctuaries began with their work and has now spread all over the world. The sheer size of waters such as Staines allows wildfowl to rest undisturbed during the day. At night many of the ducks find feeding elsewhere along the valleys of the Thames and Colne – on the rivers, gravel pits, wet grazing, and streams of Middlesex, Berkshire and Surrey. But the reservoir itself also provides valuable feeding opportunities. Unlike, say, the upland lakes of Cumbria which are often pretty barren of life, the reservoirs drain from the fertile valley of a lowland river. The water is rich in plant nutrients, and, taken directly from the Thames, already contains a wealth of seeds, plant fragments, and small animals like annelid worms, insect larvae, and molluscs. Except at the margins, though, the water at Staines is too deep to provide much for those ducks, like the tufted duck and pochard, which get their food from the bottom, or those, like the mallard and teal, which dabble in shallow water. These birds use Staines mainly as a resting place, often in large numbers. Flocks of 500 tufted duck and 300 pochard are not unusual in winter. The species favoured are those which chase and catch fish, and Staines is an excellent place to see those scarce and beautiful winter visitors, the sawbills. The name comes from the serrations on the bill, which enable a firm grip on the prey. Largest is the goosander, the drake predominantly cream with a bottle-green head and red bill, the duck grey with a brown head and white throat. Upwards of 20 are regularly seen here. As the winter deepens the tiny smew come in. The male is a pure, startling white, marked with elegant pencillings; his consort is, like the duck goosander, grey in the body with a white and chestnut head. Red-breasted mergansers also occur, as well as even rarer species like long-tailed duck and scaup. And Staines is a favourite site for the scarcer grebes, especially black-necked. On one afternoon in January no fewer than four species of grebe were present: great crested, red-necked, black-necked, Slavonian. Whenever one side of the reservoir is drained for maintenance, an expanse of mud and pools results which brings not only large flocks of teal and mallard, but waders, some of them extremely rare, including, in recent years, a number of American vagrants. Besides snipe, lapwing, redshank, dunlin and ringed plover, the drained bed often holds, in season, ruff, greenshank, little stint, grey and golden plover, godwits, little ringed plover, and spotted redshank. If you have a warm coat and gloves and don’t mind the wind, there can be few more exciting bird-watching outings than a winter visit to Staines Reservoir. From Watford, take the M25 to the Heathrow turnoff and turn south along the A3044 towards Staines. At the traffic lights turn left along the B378, and follow this road round into Stanwell Village, turning right at the pub on the corner. Keep on the B378 for another 0.6 miles; the gate leading to the path up the embankment will be on your right (O.S. reference TQ 056732). * Terminal 5, now finished and operating.